This Chicken Schnitzels Recipe is a huge hit for us. It has a perfect crust on the outside, juicy and tender chicken meat on the inside. The marinate makes it that much more tastier, by adding a pop of flavor, leaving a delectable taste in your mouth. The best part is? So easy to make! Whenever I work on a recipe, I keep my picky children in mind. If I can keep them content, everyone is happy! These schnitzels add a perfect balance in their food for that day. It fulfills their protein intake and it can be paired with your choice of vegetables and carbs. 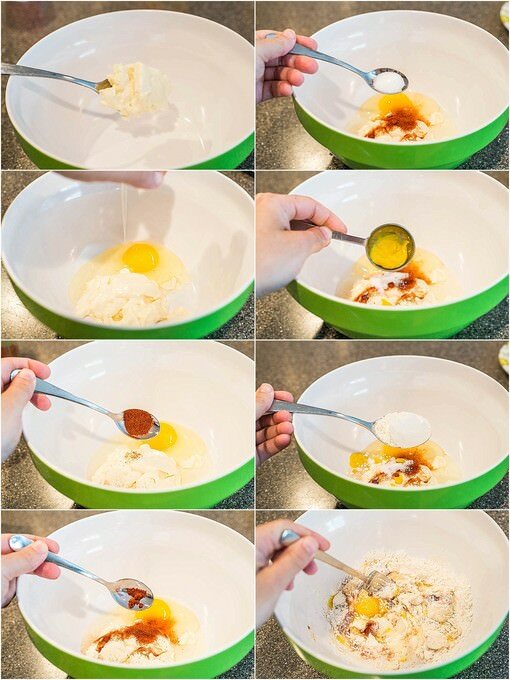 In a medium bowl mix 2 TBSP mayo, 1 egg, 2 tsp yellow mustard, 1/2 tsp salt, 1/4 smoked paprika, 1/2 tsp sweet paprika, and 1-1/2 TBSP flour. Mix all the ingredients well. 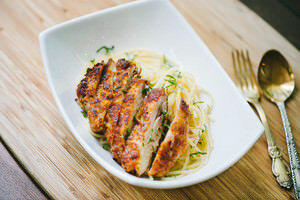 You can use either chicken thighs or chicken breast meat. 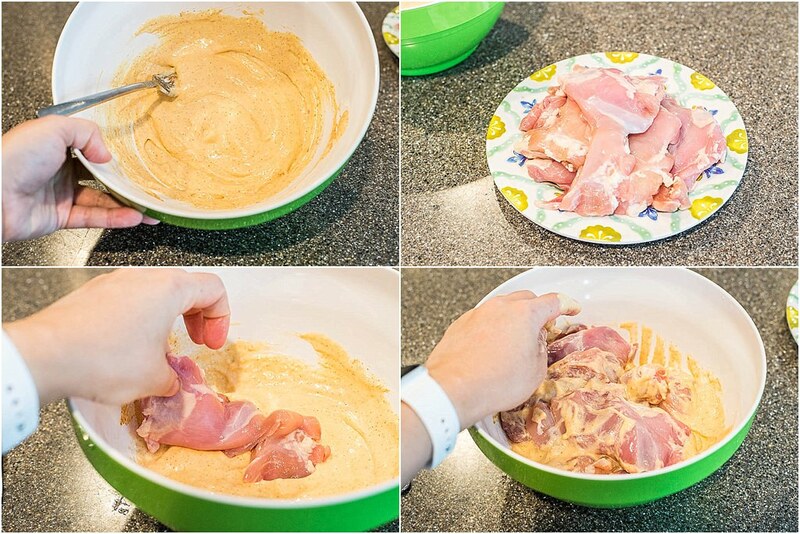 Make sure to slice the cut of chicken that you have into 1/2 inch thick pieces. I also remove the extra fat from the thigh meat I use. Dunk the meat in to the marinade and nicely coat each piece of chicken. Set aside until needed. Heat up the either a large or a medium skillet, add 1 TBSP clarified butter or ghee and 2 TBSP of avocado oil. Set the heat to MEDIUM HIGH. Place 1 cup of bread crumbs on the plate. 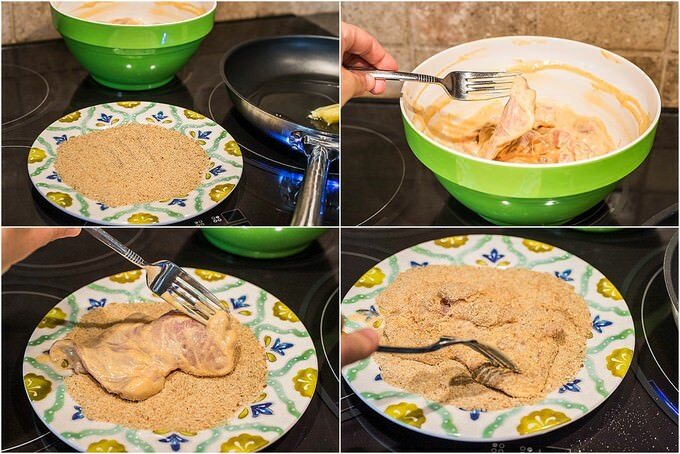 Coat each side of the chicken pieces in with the bread crumbs and place them in the hot oil. Sear both sides of the chicken schnitzels until golden brown. The oil shouldn’t burn with medium high oil. The idea is to brown the schnitzels and not quite cook it yet. Once both sides of the chicken schnitzels are nicely golden brown, take the pieces out of the skillet and place them in a baking dish. Place the dish in the oven and set the oven for 360F. 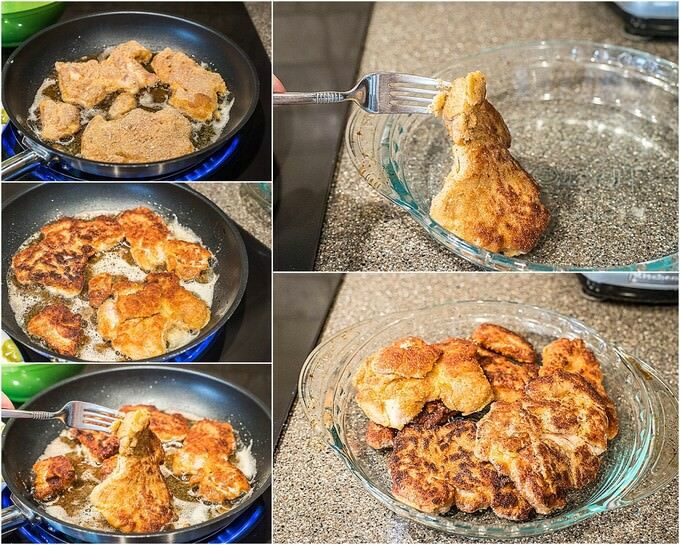 Bake the chicken schnitzels for 15 minutes. Once the baking is done, you can serve these tender inside, and crunchy outside schnitzels with anything really. This time around my kids wanted to have spaghetti with it. So, we went with spaghetti. I hope you enjoy this chicken schnitzels recipe as much as we do. Please leave your feedback in the comment section. I would love to hear your thoughts and modifications. 1 cup bread crumbs panko will work, too. Once the baking is done, you can serve these tender inside, and crunchy outside schnitzels with anything really. I have never tried chicken schnitzels before, but this looks really good. I will give it a try this week. Thanks!